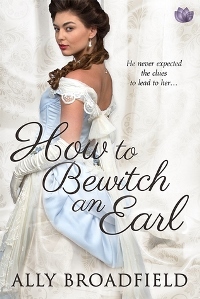 How to Bewitch an Earl is an entertaining, fast-paced romance. I’m a sucker for a story with a treasure hunt (especially if diamonds are involved) and author Ally Broadfield made the search for the missing tiara a fun one. Add in some highly entertaining secondary characters, secrets, and a romance and it’s no wonder I had a hard time putting How to Bewitch an Earl down. Edward has wanted to find the missing family tiara ever since he was a child. He’s obsessed with finding it, and since his father is reluctant to give up any control over the family estates, Edward focuses wholly on the tiara and being the frivolous heir. His parents have finally had enough and have decided it’s time for him to settle down, but at the house party they arrange it’s not a simpering debutante who catches Edward’s eye, but the secretive Isabella Winthrop. Isa is hiding her aristocratic heritage and acting as a companion so that she may help her brother pull the family estate out of debt. All she wants is to blend into the background, but sparks fly when she meets Edward. Attraction and temper combined makes for a rocky start to Isa and Edward’s relationship, but their feelings take a turn when Isa begins to help Edward on his quest for the tiara. It’s easy to like Isa. She’s not perfect, but she has a good heart and is a bright, likeable heroine. Edward is where the story hits a snag for me. I wanted to like him so badly, but he’s unquestionably spoiled. It’s logical for him to be that way given the time period, but I had hoped to see him grow as a character over the course of the story. To me, Edward never really matured, only being the hero he should be when things went his way. For me this was a problem that keeps me from rating the story higher. That being said, I cannot deny I was drawn into the story, even with my reservations about the hero. How to Bewitch an Earl is the second book in Ms. Broadfield’s How To series, but you don’t have to have read How to Beguile a Duke in order to enjoy Edward and Isa’s story. That being said, part of the fun of the book for me was revisiting Nick and Catherine (Edward’s parents and the hero and heroine of the first book). I think I liked them even more in this story than their own and it was lovely seeing how they have and have not changed over the years. How to Bewitch an Earl also introduces Edward’s sister Louisa, and I absolutely adored her. I desperately hope Ms. Broadfield writes a book for her and the man I hope will be her hero. The Adair family is unique and a lot of fun to read about, and I hope to see more of them in the future.